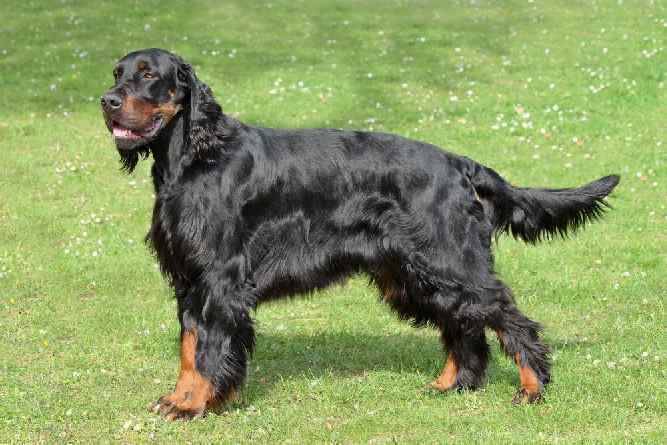 Is The Gordon Setter Temperament (Fearless, Alert, Confident) A Winner? 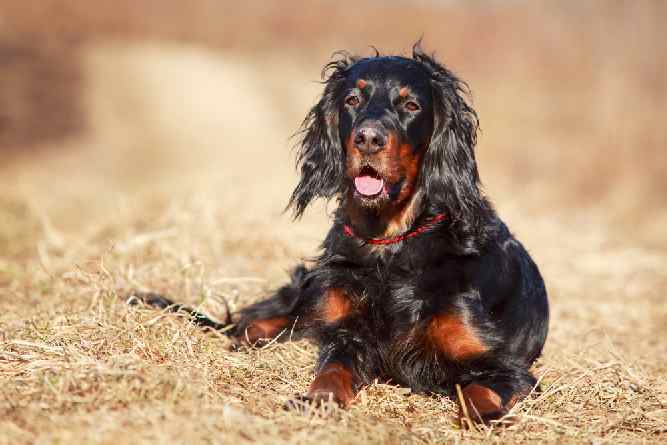 Without any doubt, the Gordon Setter temperament makes this breed a wonderful family dog. Gordon Setters are admired for being intrepid and energetic while working in the field, but loving and devoted when they curl up by the feet of their master. Like all sporting breeds, these dogs are bred to work. Gordon Setters will be happiest in a lively, outdoorsy family, where they are included in family adventures! Gordon Setters are confident working dogs that will stop at nothing when they have a job to do. This quality makes them invaluable as hunting dogs. It also makes them excellent watchdogs in modern households. Gordon Setters are bird dogs that have exceptional eyesight and hearing. Even in a city setting, they are constantly vigilant. However, they must be exercised in a secure area. If they catch sight of a bird or squirrel, their hunting instincts will kick in and they may bolt. These dogs need plenty of daily exercises. 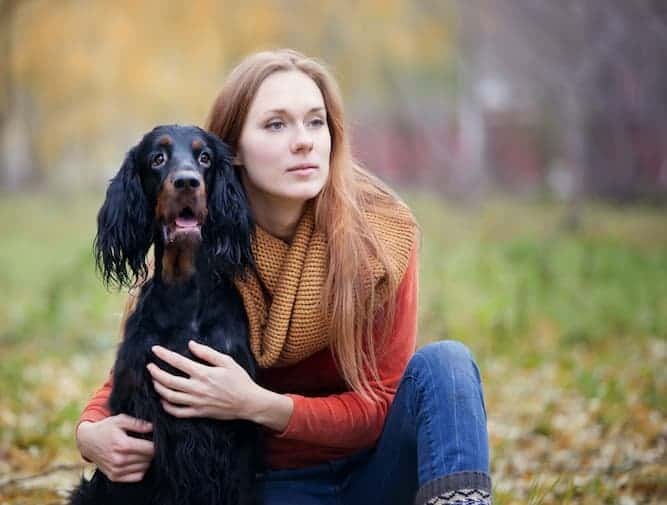 Gordon Setters are sometimes described as “high strung.” However, dogs that are described this way may not be getting the proper amount of physical activity. These are working dogs that need a job. 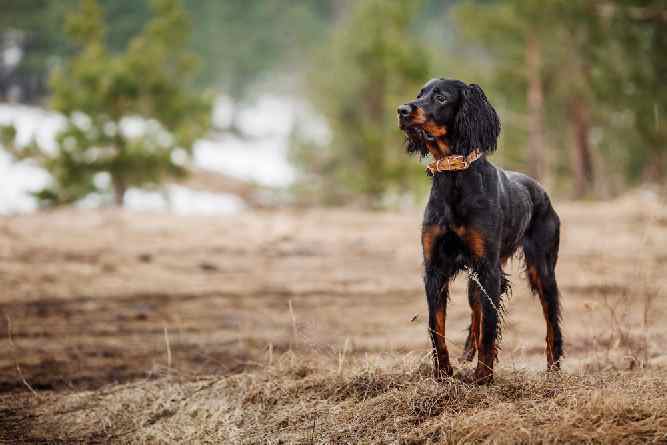 If you do not hunt, you will need to find another activity to keep your Gordon Setter in tip-top shape such as jogging, hiking or nosework. Gordon Setters are a hardy breed. They are the largest of the setter breeds. They were bred to withstand the tough conditions of the Scottish Highlands. They were even used as “nanny dogs.” They can be wonderful companions for kids as long as the children are kind and gentle. Like all dogs, it is important to socialize Gordon Setters from a young age. Gordon Setters bond deeply to their family. They can be wary of strangers until they know a new person can be trusted. The earliest ancestors of the Gordon Setter date back to the 16th Century. Black and Tan bird dogs have been a staple among Scottish and English hunters for centuries. A Scottish aristocrat named Alexander Gordon, 4th Duke of Gordon, honed the breed in the early 1800s. He kept a kennel of these setters and selectively bred them for strength and stamina. In 1924, the name officially changed to the Gordon Setter. Gordon Setters are smart, attentive and devoted. They are easy to train with gentle and positive methods. Gordon Setters are sensitive, so never use rough punishment with this breed. It is ideal to start training early with a puppy socialization class. The Certification Council for Professional Dog Trainers is a great place to find a positive reinforcement trainer for your Gordon Setter. If instead, you are up for the fun and challenge of training your Gordon Setter then look no further than Doggy Dan's -The Online Dog Trainer. It's an excellent resource filled with hundreds of Dog Training Videos. Gordon Setters weigh between 45 and 80 lbs. They stand between 23 and 27 inches tall. They have a stunning black and tan coat. The coat has extra long “feathers” on the tail, ears, chest, and legs. Gordon Setters have droopy ears and big brown eyes that give them a sweet expression. The Gordon Setter does not come in any other color variations. Black and Tan is the only recognized pattern. In the show ring, other colorations are disqualified. Although they do shed, Gordon Setter shedding can be kept to a minimum by diligent brushing, bathing, and grooming. Gordon Setters have fine hair that can tangle easily, so weekly brushing is required to avoid matting. The Gordon Setter coat needs occasional trimming—especially inside the ears, between the toes, and around the sanitary region. Gordon Setters are prone to a life-threatening condition called Bloat. Bloat, or gastric dilation and volvulus, is most prevalent in deep-chested dogs such as Gordon Setters. When a dog suffers from Bloat, its stomach rotates. This cuts off the blood supply to the stomach and it also traps gasses inside the twisted stomach. This painful condition will lead to death unless it is addressed rapidly. If you suspect your dog is suffering from bloat, rush it to the nearest emergency veterinary hospital immediately for surgical correction. Be sure to discuss all of these conditions with your veterinarian before acquiring a Gordon Setter. Note: If you agree that your dog's health should be a top priority then get a copy of The Ultimate Guide to Dog Health. Your Gordon Setter friend will love you for it. When you are ready to add a Gordon Setter to your family, please consider adoption first. There are many homeless dogs in this country and one of them might be the perfect pet for you. To start your search, visit the website for the Gordon Setter Club of America, Inc. They have a list of Regional Rescue Contacts for every state. Gordon Setters in rescue groups are usually there through no fault of their own. For example, some dogs lose their homes due to moving, landlord restrictions, or financial crisis. Other times people acquire this breed without doing adequate research. When they realize they cannot provide proper care for their Gordon Setter, the dog winds up in a shelter or Rescue Group. These are great dogs that deserve a second chance. You can search for adoptable Gordon Setters in your region by visiting Petfinder.com, Adoptapet.com, or Getyourpet.com. You might even find a Gordon Setter or Gordon Setter mix at your local animal shelter or humane society. Even if you do not locate a Gordon Setter during your first visit, leave your name and phone number in case a Gordon Setter shows up in the future. The cost of adoption varies depending on the agency. Gordon Setters that come from adoption agencies are already spayed/neutered and vaccinated. The total price tag can be anywhere between $75 and $200. 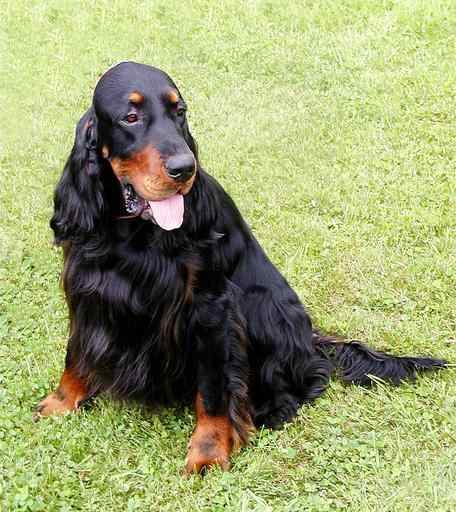 If you are looking for a Gordon Setter breeder, a good place to start is the Gordon Setter Club of America. The club has a breeder referral service. When you contact the service, a representative of the club will match you with breeders in your region who may have Gordon Setter puppies for sale. The Gordon Setter Club of America also has a list of Gordon Setter breeders by state. However, you still need to do your own research to make sure the breeder is responsible. Make an appointment to visit the facility and ask to meet the parents of the puppies. Make sure the breeding dogs are clean, healthy and friendly. Ask to see medical records and the results of genetic testing. A quality breeder will ask you just as many questions as you ask them! They want to ensure that their Gordon Setter puppies go to good homes. You may have to wait a year or more to be matched with a puppy. Reputable breeders will not over-breed their dogs. Gordon Setters are a fairly rare breed. When you find a Gordon Setter for sale, the cost can be pretty high. The average Gordon Setter price is around $1,000. Conclusion: Why the Gordon Setter? There is no doubt that the Gordon Setter temperament makes it a wonderful family dog. Although Gordon Setters are not for every family, they are perfect for active and energetic households. 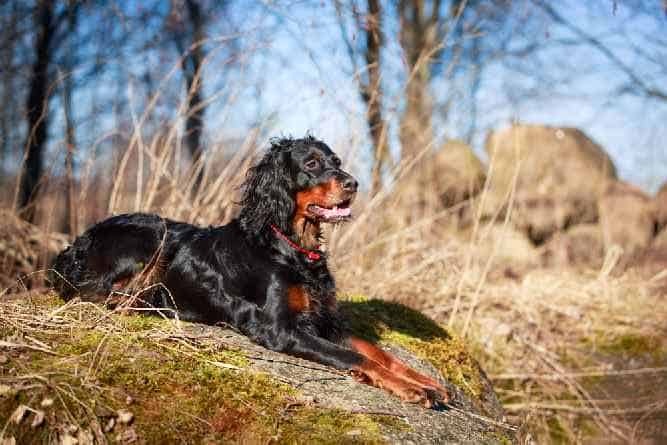 If you love the great outdoors and you want a hardy and loyal companion, look no further than the Gordon Setter. Previous post: Living with the Belgian Tervuren Temperament (Energetic, Intelligent, Protective): What More You Can Expect?